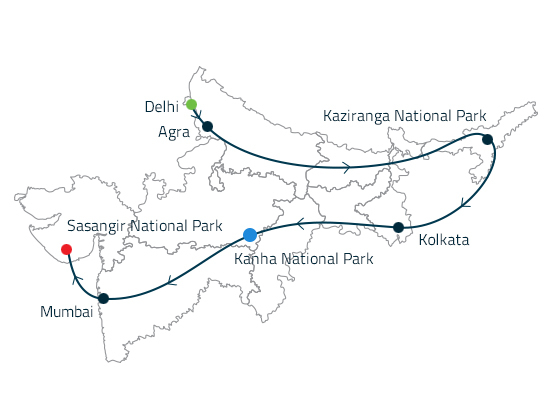 This tour covers a lot of ground, but give you an opportunity to see India’s Big 5: the Asiatic lion, leopard, tiger, elephant and one-horned rhino. From the UNESCO World Heritage site of Kaziranga in Assam, to the plains of Kanha in Madhya Pradesh, the inspiration for Kipling’s Jungle Book, to Sasangir in vibrant Gujarat we also add in sightseeing tours of historic Delhi, Agra, home of the magnificent Taj Mahal, the city of joy, Kolkata and cosmopolitan Mumbai. India’s Big 5 – Wildlife Trails will bring you close to the natural beauty of India’s wildlife sanctuaries and will give you ample opportunity to explore the jungle. Start after a relaxed breakfast and drive on the new expressway to Agra. The drive takes approximately four hours. In Agra, you are met on arrival and transferred directly to your hotel. Later, you meet your guide in the lobby and make your way to see the Taj Mahal in all of its sunset glory. 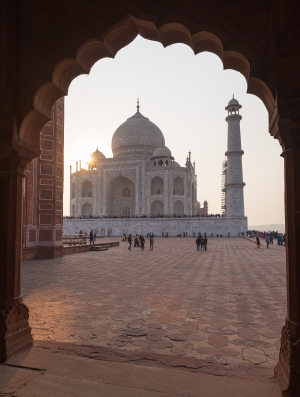 The Taj Mahal truly is one of the most stunning pieces of architecture in the world, and as the rays of the sun fall on the marble tomb the monument perfectly reflects in the stillness of the pools adding to the beauty, majesty and splendor. A monument of love built by the Mughal Emperor Shah Jahan in 1630 for his Queen Mumtaz Mahal to enshrine her mortal remains, 20,000 men labored day and night for twenty two years to build this masterpiece which has held the world awestruck ever since. This evening, enjoy a live show a la Bollywood style re-enacting the eternal love story of the stunning Taj Mahal. Full of pageantry, drama and colour this is an entertaining extravaganza and just a little over the top like typical melodramatic Bollywood stories and enactments! Overnight in Agra. Enjoy a sunrise visit to the Taj Mahal. Return to your hotel for breakfast and then set out to explore some of the other important sights. 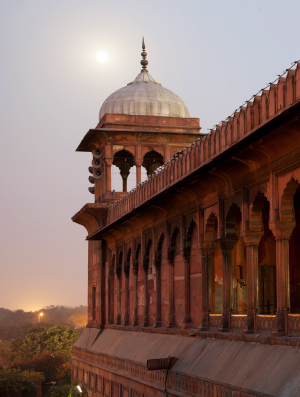 Agra Fort is a magnificent 16th century fortress and remains as one of the finest Mughal forts in India. 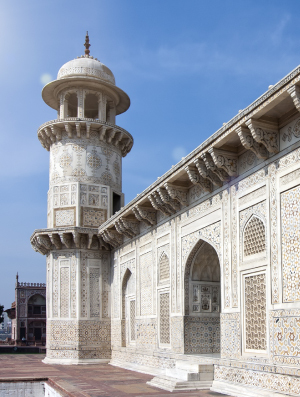 There are several mosques, public halls used for audiences, the elaborate Mirror Palace, and a white marble tower where Shah Jahan’s son imprisoned him for eight years until his death. 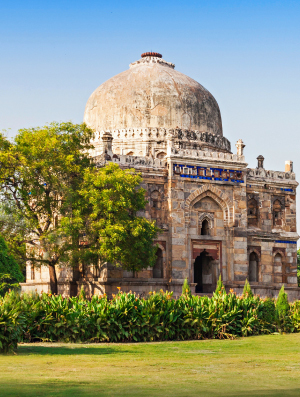 Next visit the tomb of Itmad- Ud-Daulah, referred as the 'jewel box' and often regarded as a "draft" of the Taj Mahal. After Itmad-Ud-Daulah, return to the hotel for lunch, check-out and then drive back to Delhi, arriving by evening. Transfer to your luxury hotel and the evening is at leisure. Overnight in Delhi. Today is travel day. After breakfast transfer to the airport for your flight to Guwahati. On arrival in Guwahati, you are met and escorted to your vehicle. A five hours drive takes you to your hotel in Kaziranga. The rest of the day is at leisure. Overnight in Kaziranga. You begin your wildlife adventure on the trail of the first two of your Big 5, the one-horned rhino and wild elephant. 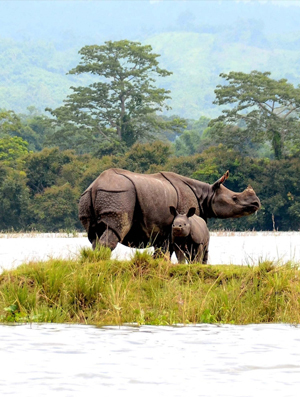 Kaziranga National Park is one of the lesser known wildlife parks in India, covering some 430 square kilometres and set within the flood plain of the mighty Brahmaputra River. It has the largest population of rhinos in India. With nearly 80% of the world's population resident, the park has been recognized as a World Heritage site. In addition to wonderful rhino viewing, the park is also home to large herds of elephants and water buffalos. Tigers though rarely seen in the long grass also find a home here. The park also shelters other species such as Sloth Bear, Leopard, Swamp Hog and Barking Deer, Sambar Deer, Pygmy Hog, Jungle Cat, Hog Badger and the Capped Langur Monkey. Apart from the rich wildlife, Kaziranga is a birder's paradise with large numbers of resident species boosted considerably by visiting winter migrants. Game viewing here is conducted in the mornings and afternoons by jeep. You have your own private jeep with your Naturalist on all game drives. In between the game drives take a break for lunch, and the day will finish with a great dinner. Overnight in Kaziranga. Morning and afternoon game drives are reserved for you. 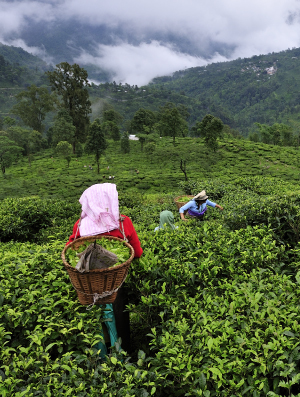 There are some other activities as well that you can participate in between the game drives; visit local villages, take a walk through a rubber plantation walk and learn the process of sap collection, pay a visit to an Assam tea garden. But of course, the focus is 'the wildlife' and once you have taken all the sunset images you need, return to the lodge for yet another delicious local dinner. Overnight in Kaziranga. Today you drive back to Guwahati airport for your short flight to Kolkata. Arrive in Kolkata by late afternoon and you are assisted with your transfer to your luxury hotel. India’s second largest city, Kolkata is also its cultural hub. The former capital during the British Raj and a trading post of the powerful East India Company, the city still retains many architectural relics including the splendid marble Victoria Memorial. 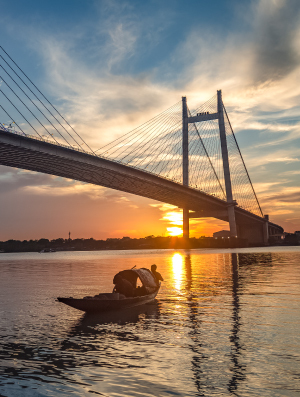 But it also offers tourists opportunities to explore lively markets, stroll through lush gardens, visit iconic temples and enjoy simple boat trips on the Hooghly River. The evening is at leisure. Overnight in Kolkata. Enjoy a full day tour of this city that starts after breakfast. Begin at the Victoria Memorial containing a collection of Victorian memorabilia, including Queen Victoria's Piano. 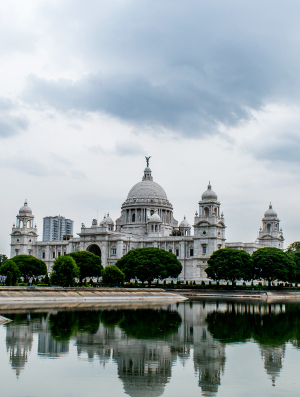 Nearby is the old British fort, Fort William and the 48-metre high monument along with the Kalighat temple and the Raj Bhavan which was once the residence of the British Viceroy in India. The Indian Museum is perhaps one of the country’s best museums and offers you an rich collection of art, as well as fossils and meteorites. Spend the afternoon in College Street in the university quarter and sip coffee surrounded by the intelligentsia at the famous Indian Coffee House. It gives you a healthy understand Kolkata’s long-standing reputation as a centre for learning and political philosophy. In the evening, take a walk on banks of the River Hugli for an excellent view of the Howrah Bridge, crossed each day by more than a million commuters. Luxeperience: Here, board your private boat and enjoy a trip to the former French, Dutch and Portuguese settlements on the banks of the river. There is a certain timelessness to the experience that is extraordinary. Overnight in Kolkata. It is an early morning start today as you fly by the first flight to Raipur. In Raipur, you are met by your Luxe representative and proceed for a hot breakfast. Fortified by food you begin your four and a half hour drive to Kanha National Park. The drive to the park is on a paved road and you arrive at your lodge for a late lunch. After check in, set out for an afternoon game safari with your Naturalist. The game drive ends with the setting sun, and you return to your accommodations and retire early after a satisfying dinner. Overnight in Kanha. We have dedicated two full days in your trip for the exploration of the National Park. Beautiful, deadly and endangered, the tiger is all of these and it is the largest of the four “big cats” (lions, jaguars, leopard and tigers). 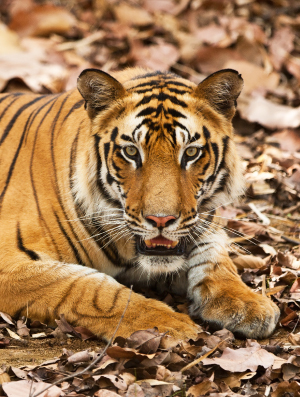 In Kanha it is an apex predator, meaning it resides at the top of their food chain with no predators of their own. You finish breakfast by the time the soft rays of the sun break the darkness and with your Naturalist drive out into this fascinating park armed with your cameras and binoculars. 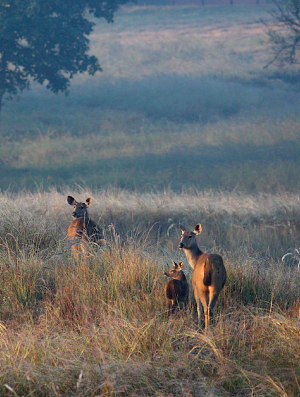 Kanha is also referred to as “Kipling country”, since the nearby forests were the setting for the "Jungle Book". 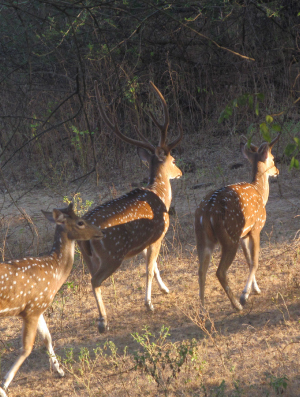 It is one of the best places in India to see tigers, but also Gaurs (bison), wild dogs & cats, jackals and deers. Spotting wild animals is always a matter of luck, but Kanha National Park is so rich in wildlife that the odds are tilted in our favor. Return to the lodge for lunch and later again after the afternoon game drive as dusk settles and have a lovely dinner before calling it a night. Overnight in Kanha. Today is just like the one before – after breakfast, set off on a morning game drive and after lunch and a short siesta, spend the entire afternoon in the bush. Tonight at dinner you will say goodbye to the fascinating Kanha National Park as you resume your travels again. Overnight in Kanha. After a leisurely breakfast, set out by road for your drive to Raipur airport, approximately four and a half hours away. Transfer to the airport for your later afternoon flight to Mumbai. 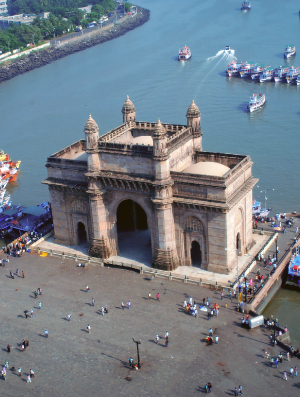 In Mumbai you are met on arrival and transferred to your iconic hotel. 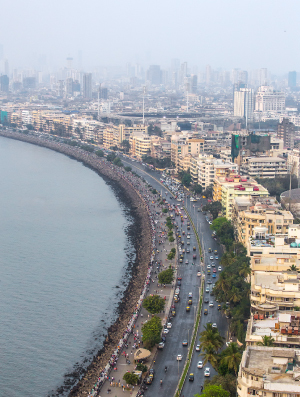 Formerly known as ‘Bombay’, Mumbai, the capital of Maharashtra, is India’s giant commercial and institutional hub, a melting pot of cultures and communities and home to Bollywood, the world’s most prolific film industry. The city also has fabulous colonial-era architecture, world class hotels, superb restaurants, and a vibrant nightlife. Overnight in Mumbai. 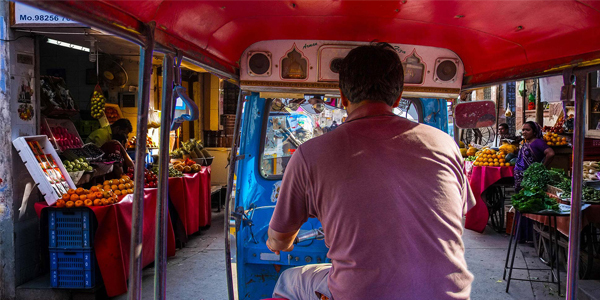 Take a break from the wildlife trail and enjoy a tour of vibrant Mumbai. After a relaxed morning, your Luxe guide meets you in the lobby of your hotel and you set out to explore the city’s classic sights, including the Gateway of India, an 85-foot-high arch whose design reflects India’s Muslim and Hindu traditions. Next, tour Kala Ghoda, the culture and heritage hotspot. Apart from its phenomenal Victorian neo- Gothic architecture, Kala Ghoda is also home to cafes, restaurants, fine shops, and boutiques. 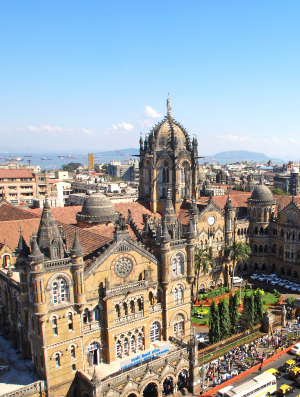 Then, see the extraordinary Chhatrapati Shivaji Terminus, a UNESCO World Heritage monument. Built between 1878 and 1888, the Terminus is delicately carved and richly sculpted, with stained-glass windows. Luxeperience: In the afternoon, enjoy a culinary session followed by lunch with a Michelin Star chef. Later, you visit Dhobi Ghat, a sight unique to Mumbai. ‘Dhobi Ghat’ (‘washer folks’ place’), is the world’s largest outdoor laundry, where Mumbai’s traditional dhobis provide a wonderful service – collecting dirty laundry, washing it, and returning it neatly ironed, all for a very small fee. Your last stop is Mani Bhavan, the place where Gandhi used to stay when he used to visit the city. Overnight in Mumbai. Bid goodbye to Mumbai and transfer this morning to the airport for your flight at noon to Diu. On arrival, your Luxe representative greets you and you have just enough time for lunch. 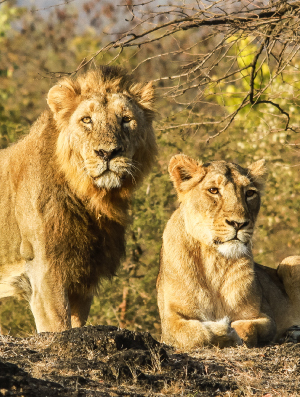 From Diu, it is another 3 hours’ drive to your destination of the day – the world famous Sasangir (Gir) National Park, the only remaining home of the approximate 500 Asiatic Lions. Upon arrival, take advantage of the last hour of daylight and indulge in some photography of stunning sunset shots and wildlife before you have a refreshing shower and gather in the dining room for a delicious, traditional dinner. Overnight in Sansangir. The morning game drive starts at the sunrise. The afternoon one, like in the other National Parks, post lunch. 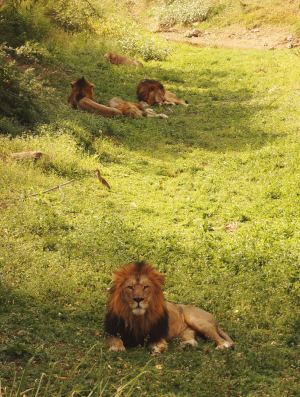 Many come to Gir because, outside of Africa, it is the only place with wild lions. Asiatic lions tend to be smaller than their African cousins. Adult males typically weigh between 350 and 420 pounds, while adult females weigh between 240 and 365 pounds. The largest Asiatic lion on record measured 9½ feet from the tip of its nose to the tip of its tail. And while the sun shines on the lion, this other cat - utterly beautiful and graceful - lurks in the shadows. 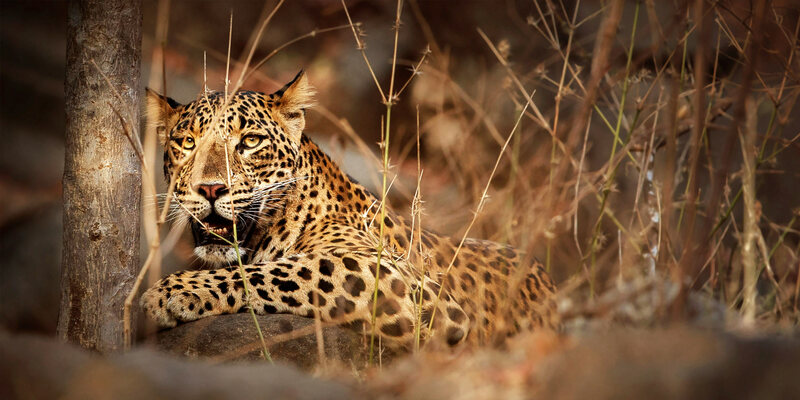 Rarely spotted in its natural lair, the elusive leopard when spotted is a sight to behold. 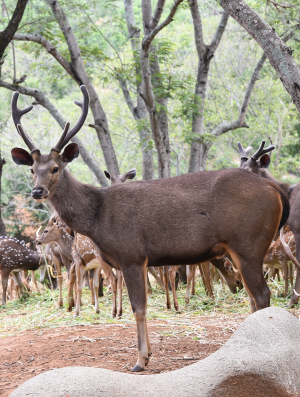 Other animals in the Park are Sambar, Nilgai, Chinkara, Black Buck, Four-Horned Antelope, Wild Boar, Indian Flying Fox, Indian Pangolin and Indian Porcupine. Not surprisingly, it is hard to keep up and try to remember the names of all of these unique animals. 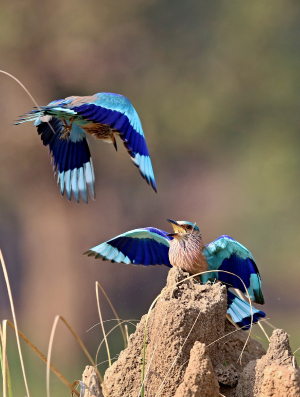 For birders, an estimated 300 species are found in Gir and the bird lover in you is assured to have a fantastic day, as well. Both lunch and dinner are served at the camp Overnight in Sasangir. Today too you spend the day discovering the wildlife in the Park. After breakfast, set off on a morning game drive and after lunch and a short siesta, spend the entire afternoon in the bush. Tonight at dinner you will say goodbye to the fascinating Sasangir National Park as you resume your travels again tomorrow morning. Overnight in Sasangir. Later, depending on the time of your international flight you are assisted with your transfer to the airport for your homebound journey. In the meantime relax and you can wash & change at your hotel in Mumbai.